When I first started brewing I had no palate whatsoever. I couldn’t taste the difference between any sort of IPA (I still have trouble with this), all stouts were the same, and every beer I made was “good”. As I continued brewing, my palate developed on its own, I never thought about it. I just tried more and more things, but more importantly I started paying attention. Developing that palate (an ongoing process) has been one of the most critical personal improvements in regards to brewing because it means I can identify flavors in my beer that I enjoy and flavors that I dislike. This has really refined my recipe construction process, and it isn’t something I can relay easily through words. This makes it difficult for me to give criticism, because if you don’t have the palate for “astringent” it is difficult for me to accurately describe. As much as I love words, they are often incomplete and under-erasure, useful but flawed (I just brought Derrida into a conversation about homebrewing, you’re welcome). Why develop a palate for off-flavors? Because of this trouble in transferring palate through language, it can be difficult to explain to other brewers exactly what is “wrong” with a beer. It is one thing to read How To Brew and think “oh ok, diacetyl is a butter taste” and a whole other to have a perceptive idea of what that taste is. I find it incredibly important to develop a palate, and especially a palate for off-flavors. If you want to grow as a brewer, this is a great place to start. Now, why especially for off-flavors? Because they are damn tricky. Off flavors can be sneaky, they aren’t always in your face “oh man this beer is terrible”, they can hide and come out in a way that you just can’t quite place. Developing a palate for good flavors is fantastic, but making sure there are no off-flavors, in my opinion, is the first step. So how do we develop this palate? I’ve seen a few people recommend intentionally ruining beers, but I just don’t think that works. Too many factors, and there are other perceptive differences that will interfere. The BJCP also sells an off-flavor kit, but that can run $50 as part of a registered course or $100 for a member of the BJCP. Quite pricey. But I do think their approach is better, add a small vial of off-flavor to a light beer and pick up the differences. This is more exact than trying to intentionally ruin a beer via process where a variety of off flavors may be present. But still, a bit expensive and also for BJCP members. But this is homebrewing, we are largely a DIY group of people, and so in this blog post I am going to talk about replicating these flavors at home so you can learn to identify them. I’m going to start by going through two 5-Common Homebrew Off Flavors articles from the American Homebrewers Association (Article 1 and Article 2) which list some incredibly common off-flavors. There are more and I may explore them in the future, but for now let’s start with the big 10. Your preferred Macro Light Beer. I personally used Coors Light. Just don’t use Budweiser since there are reports of acetaldehyde in the beer already. Also don’t use Miller, since they use a modified bittering agent that doesn’t react with UV light. We don’t want to throw your perceptions off, though it won’t matter in the long run since you are adding ingredients to it and contrasting the two samples. I’ll provide pictures of the side-by-side for each of these, the variable will always be on the right and the control will be on the left. Basically, to prep for each of these off flavors, you are going to want to pour two glasses of your preferred macro light beer, four ounces of each. Preferably use small glasses that you are able to really get the aroma of the liquid from. One of these four-ounce glasses will be your control, the other is what you will add something to in order to replicate off flavors. Clean your glasses in-between tastings, I recommend a quick dip in star-san as well. If you want to be really thorough, you can also eat some unsalted white crackers, drink a glass of water, and smell coffee beans/lemon slices to reset your palate. It also may help you to take notes during this process so you can recall the characters you got during these tests. Not everyone perceives things in the exact same way, so a step in developing your palate is understand how you perceive different flavors (even good ones). Mix the ingredient in and let the beer warm up to room temperature. Smell and taste the glass without the addition (don’t finish it), pay attention to the flavors, mouthfeel, aromas, everything. Now, go ahead and do the same with the beer that has the ingredient mixed in. Again, note everything from aroma, to flavor, to mouthfeel, to appearance. Have some water, and take another sip of the glass without vinegar (you can go ahead and finish it), pay attention to the contrasts. Short Disclaimer: Originally, I had this section written as acetaldehyde, and was corrected. These vinegar flavors are actually acetic, rather than acetaldehyde, which can be replicated (supposedly) with green apple jolly ranchers. I will be trying this out soon, and then I will update this, but for the time being acetaldehyde isn’t in this article, and these notes apply to acetic. Acetic flavors are often described as vinegary, in both aroma and mouthfeel. Acetic flavors are most often caused by bacteria, typically from an airborne infection during fermentation. Run through your prep and add 1/4 tsp. of white wine vinegar to one of the glasses. At 1/4 a tsp. in 4 oz, the difference is pretty subtle, but it is absolutely there. I get it more in the nose than anywhere else. I wouldn’t categorize it as green apple, but I can see where that imagery comes from. It is more of an acidic tang, it isn’t even something I would categorize as bad unless I had the control right next to me. For the sake of really exploring the off flavor, I re-poured the glasses and added 1/2 a tsp. this time instead of a fourth. Way more present now, but roughly the same, except now that tang is taking away from the malt profile that I get in the control. It also leaves an unpleasant flavor in the mouth, right on the back of the tongue. I absolutely recognize this flavor from my own homebrew, and honestly I’m not sure I associated it with acetic flavors before. It really detracts from the beer, and I wouldn’t even call it a terrible flavor, but it does more damage by masking other characters. Astringency is a strong, dry bitterness. Some people perceive it as a mouth-puckering quality. It has also been noted to have some grainy characteristics, which is a nod in the right direction towards where it typically comes from. Astringency comes from tannins, and so a common cause for astringency in beer is sparging or mashing far too hot, over 168°F. It can also be caused by the brown-scum byproduct from krausen being mixed back into the beer, over-milled grains, a mash pH exceeding 5.6. Take your 1/8 tsp. of tannin powder and dissolve it in a little bit of water. Pour it in one of your glasses, and be prepared for some foam. That dry, puckering quality like sucking on a used-tea bag is astringency. Aside from the obvious color change, the glass with tannins just smells powdery and dry. On the sip, the flavors are a bit muted and the dry-mouth feeling is incredibly obvious. It lingers on the tongue, exactly like the used tea-bag feeling. I get a little of the puckering quality but not much. An easier way to replicate that, in my opinion, is going to the store and getting a cheap, dry red wine. That puckering, dry sensation is what you are looking for. Diacetyl is often described as popcorn-like, with obvious butter characters. It can also contribute a “slick” feeling to mouthfeel. Diacetyl is produced by fermentation, and in some styles it is even desirable in limited amounts. More often than not, diacetyl is eliminated towards the end of fermentation. So fermenting too cool and not having a diacetyl rest can be one culprit, it can also be caused by bacterial infections of pulling the beer off the yeast too soon. Go through prep and add the 1/2 tsp. of imitation butter to a glass. Stir it in, prepare to be bombarded with butter-characters and a slick mouthfeel. Familiarize yourself with this flavor though, because it is one of the most common off-flavors out there. Gotta admit, I wasn’t looking forward to this one at all. Intense buttery aroma in the nose. The flavor has a popcorn like quality, buttery, still some malt character. I tasted a little of the butter extract, and it is a surprisingly different flavor when it has been sitting in the beer. All the more reason to be familiar with it. I don’t get much of a “slick” feeling, but I imagine I would have had I used more extract or if this was produced naturally. Either way, not a very good character, but an important one to know. Commonly referred to as DMS, dimethyl sulfides are often described as vegetable-like, comparing it to creamed corn, cabbage, and green beans. During the malting process, S-methyl-methionine (SMM) is produced. Roasting and toasting reduces the amount of DMS, which is why DMS is often most recognizable in light beers that use more base malts. During the boil of the wort, SMM is converted to DMS, and DMS vaporizes and boils off in the wort. So DMS can be caused by short boil times or excessive amounts of DMS. It can also be caused by cooling too slowly, since DMS can be produced post-boil while the wort is still above 158°F. Finally DMS can be caused by a bacterial infection, but when it is produced by bacteria is has more of a rancid sort of character. Go through prep and add some of the juice from a can of corn. This is going to be a bit excessive, but if you want you can add more and less juice to a few different glasses to see how you detect it at multiple levels. It might be easier to start high and go low, since you’ll be pushing your perceptive threshold as you go lower. I think this was my least favorite one, because it just made my beer taste like corn. I used 1/2 a teaspoon of the juice from the can, and it absolutely did the job. Not a complimentary flavor to beer, not at all. Have you ever cut yourself and and sucked on the wound? That iron taste from your blood is a metallic taste, often described as tasting like pennies. It is also perceived as an odd metal-like sensation on the palate, which is more of a nod towards mouthfeel than flavor. Metallic flavors are often caused by unprotected metals leeching into the wort. This could be from an aluminum or iron cooking utensil/kettle. Stainless steel will not leech metallic flavors. If you’re getting metallic flavors and you use an aluminum kettle, look into proper cleaning procedures for an aluminum kettle and develop a layer of aluminum oxide. It can also be caused by high concentrations of iron in your brewing water. Keep in mind there are two primary sorts of metallic flavors, iron and copper. They are distinguishable, but both categorized as “metallic”. Go to your local hardware supply store and get a small copper pipe. Sanitize it thoroughly. Prep, let it sit for about a minute, then take the pipe out and sample. Initially I didn’t think I got much from this, but mid sip there was a hint of metal and after that sip I noticed ir more each time. Pennies, blood, a metallic twang. Typically, you will hear people describe oxidation as wet cardboard, but I personally perceive a stale sort of characteristic. This can also taste somewhat like sherry. Compounds in the beer being oxidized. This could be from excessive barrel aging (where some of the qualities brought on by oxidation are desirable), or from oxygenating the beer while bottling/kegging/in primary/what-have-you. Point is, it comes from the beer’s excessive contact with and exchange of oxygen, post-fermentation. This one if a bit tougher, because we can’t directly add oxidation to a beer that will be perceived the same way. One way to replicate the sherry-like qualities is to, obviously, add a little dry sherry to the beer. As for the stale quality, pour your small glass of beer and let it sit out (out of sunlight) for several hours. Let it sit. You’ll start to notice some stale notes in the beer. So the aroma with the variable glass, which has sherry in it, isn’t terrible. Some sweet fruit-like notes. The flavor though is recognizably like oxidation. It is a bit difficult to describe. It is a little dry, fruit. Not at all unpleasant in small amounts, but I can see how it could quickly dominate. It is also just a flavor that isn’t acceptable in most styles. I don’t get any cardboard here at all. The “stale” glass, taste bland, blank, and honestly a bit like cardboard, which I found surprising. I didn’t expect to get any of the character, and there is a bit there. Like it sounds, this off-flavor is often perceived as “skunky”, which isn’t helpful for someone who isn’t familiar with the smell, but it is also a bit tough to explain. In my opinion, the smell is comparable to burnt rubber with a sour sort of character. It is pretty terrible. Skunking is caused by isohumulone bittering compounds in hops reacting with certain wavelengths in light, notably UV. To be a bit more specific, the “skunky” flavor in beer is 3-methyl-2-butene-1-thiol, or MBT, and is the same thiol that is found in a skunk’s scent gland. Hence, skunky. Pretty simple actually. Pour one prep glass, leave it outside in the sun for a few hours (it won’t take this long, but this is about getting reallynoticeable off-flavors in your beer). Pour another glass and let them both come to room temp, and sample. I apologize in advance for you tasting this. I grew up and live in the midwest, and I’m all too familiar with the smell of skunk. A good friend of mine was once sprayed, and the teacher sent him home. I didn’t think a beer could bring me back to that moment in my life, but here we are. It also reminds me a bit of family re-unions where my dad would let me sip some of his beer, which had unfortunately been sitting with him in the sun for well over an hour. There is a definite skunky quality in the nose and flavor. No burnt rubber at all, but skunk. Absolutely skunk. Blegh. Soap characteristics are pretty much how they sound, soap-y and detergent like, sometimes accompanied by a puckering-quality. The typical culprit is, quite literally, soap. This means the use of soap or detergent to clean your brewing equipment/bottles/glasses and the flavor carrying over. Typically, the drinking glass is the problem. It is also possible to get these flavors from leaving the beer on the yeast too long, and fatty acids in the trub can start to break down, creating soap. This takes a while though, so usually it isn’t the issue. This one is a no brainer, add a little soap to one of your sample glasses, mix, and try it. Not much to be said, it isn’t pleasant, and it is something you are probably already familiar with, but it doesn’t hurt to learn to pick it out in beer! Pretty much exactly what I thought it would be, a bitter character with a lot of soap. Not the worst one on this list, but still not pleasant. Thankfully the issue is easily solved! Still valuable to know how to call out the flavor. Solvent-like characters are often described as “hot” or as fusel alcohols. Essentially it is a strong alcohol flavor that can be perceived as intense. A solvent-like character is often perceived through the aroma, flavor, and/or mouthfeel of the beer, and are often harsh. High fermentation temperatures, low-pitch rates, and a really young beer. Advice a lot of brewers with a solvent problem get is to “let it age” since these alcohol characters tend to mellow out over time. Not that they necessarily will. Solvent characteristics can also be leeched by cheap plastics used in the brewing process and exposed to high temperatures. So besides actually brewing a beer and subjecting it to incredibly high fermentation temperatures (maybe make a half gallon?) there aren’t many products I can advocate for to replicate the perception, because it essentially amounts to huffing solvents like cough paint thinner and rubbing alcohol cough. Sarcastic coughing aside, don’t drink this stuff. Really. If you want to taste something, get some low-shelf bourbon or (even better) some incompletely rectified (raw) vodka. Sip this stuff, don’t pound it, and if you can find a small sample. I couldn’t get raw vodka, so I went with terrible low-shelf vodka, and even that doesn’t have the fusel-y notes I’m looking for like paint stripper. I actually don’t get much aroma from it at all, but the alcohol heat is absolutely noticeable. I think it is worth trying so you can associate yourself with the characteristics, but paint thinner will be your best bet for aroma. But, again, be careful. Sulfur (more specifically we are talking about sulfur dioxide and hydrogen sulfide) is often characterized as rotten eggs or burnt match-like. Lager yeast strains are notorious for producing sulfur-like qualities, but these can age out with time. Sulfur can also be caused by autolysis, leaving a beer on yeast for so long that, eventually, the cell walls rupture and impart off-flavors. It can also be attributed to a young beer, so give it some more time before declaring it as ruined. Finally, low pitching rates and unhealthy yeast can cause this to occur. Take 1/4 of a campden tablet, crush it up, and dissolve it in 1/4 ounce of beer. Now, using a teaspoon (or smaller), start adding this mixture to one of your prep glasses, mixing, and sampling. Add more as needed until you can perceive the sulfur qualities. Keep in mind that, according to MoreBeer, people with asthma and sulfite-sensitivity/intolerance should not consume this. So you can smell the mixture still and pick up those off-flavors, but don’t drink. I have asthma, and I drank this. I know I shouldn’t have, and for your safety I don’t think you should either, but here we are. I kept an inhaler next to me just in case, for the sake of safety, but full disclosure I went ahead and did it. The smell was off, but it wasn’t quite “sulfur”. The flavor though definitely had sulfur notes, though not as I initially believed I’d have categorized them. I also had a bit of an asthma issue. Nothing to be worried about, but lungs tightened a bit so be on the lookout for that if you are prone to asthma issues. Not at all pleasant, but not as close to burnt=match as I would like. It could be that I didn’t use enough campden, or that this isn’t quite close enough to really replicate the flavor. Light a match, blow it out, smell (which means waft, not straight up inhale), and note those burnt-egg characteristics. That is sulfur, and that’s what you should be on the lookout for. 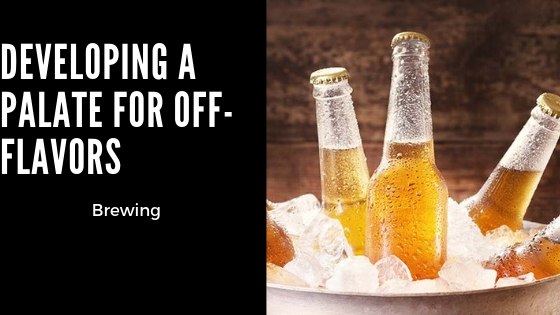 Learn the off-flavors and not only will you be able to give other people more valuable feedback, but you’ll be able to identify the issues in your own beer. The flavors I’ve recommended here are not exact, but they are each a great starting point for identifying these common off-flavors. Special thanks to /u/rayfound of the /r/homebrewing community for this farmhouse amber, great way to remember that there is good beer in the world after drinking all of those samples.